The Master ECOM-ALGER, was established at the University of Kinshasa to optimize eco-health research strategies against infectious agents and other health risks. Directed by Pr. 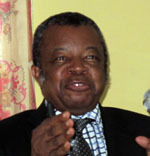 Jean-Jacques Muyembe, organized by Pr. Didier Bompangue and his team, the Master ECOM-ALGER was designed in close collaboration with the staff of the Chrono-environment department and the Master ECoS, as part of an inter-university convention joined by the Embassy of France in DRC. It trains students to integrate methods of ecology and epidemiology to analyze the causes of epidemics and ecosystem sensitivity to various environmental risks. Since the master opening, students have renovated space, equipped with wifi and computers within the Faculty of Medicine of the University of Kinshasa. These facilities are located near the Research and Training Unit in Ecology and Control of Infectious Diseases (URF-ECMI). The “Journées des Grands témoins”, as in the master ECoS, are one of the highlights of the training cursus. Students present and discuss their research topic with internationally recognized researchers. Pr. Jean-Jacques Muyembe, director of the National Institute of Biomedical Research (RDC), Dr. Gudrun Bornette, Pr. Patrick Giraudoux, Pr Frédéric Mauny from the UFC/CNRS research unit Chrono-environment (France), were the great witnesses of this first promotion. 23 students, most health professionals already inserted in the epidemiological surveillance systems of the country, presented their research internship projects on Ebola, river blindness, plague, cholera, sleeping sickness, malaria, leprosy, shigellosis, bacteremia multidrug-resistant germs, yellow fever, tuberculosis, traffic accidents, natural hazards, etc. Financially supported by the Master ECOM-ALGER and the Institut Universitaire de France, the visit was an important step for further international action. It brought together scientists from various contributing disciplines (ecology, geography, health sciences, etc.) 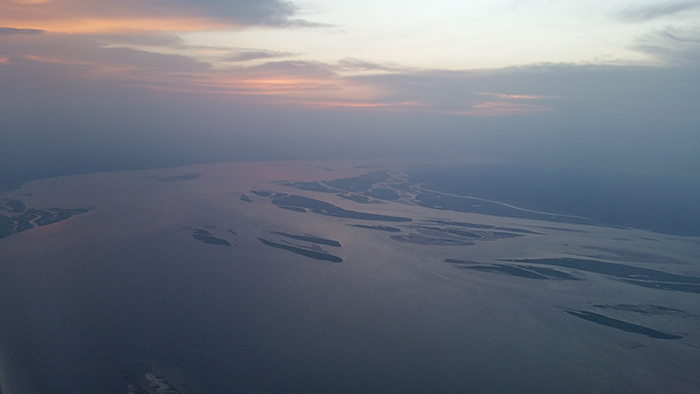 to carry out basic and applied research in relations between ecology, environment and health, close to the field, in connexion with local stakeholders who have to cope with prevention and control in DRC. The second class of students of the Master ECOM-ALGER held the "Journées des Grands Témoins" 2016 on the campus of the University of Kinshasa. Pr. 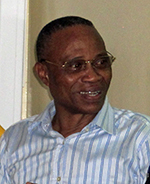 Jean-Marie Kayembe, dean of the faculty of Medicine, introduced the meeting and underlined the importance of the Master ECOM-ALGER for his faculty, the first to comply already with the LMD standards and its international dimension in DRC. The 23 students presented their own research projects including malaria, STD, typhoid perforation, occupational accidents, antibiotic resistance, nosocomial diseases, pian, schistosomiases, Buruli ulcer, diarrheic diseases, cholera, traffic accidents, chronic and acute malnutrition, monkey pox, pollution by pesticides, all health issues of major importance in DRC. More than 110 people attended the conferences and 22 student’s presentations. Students are now working in their respective host lab. The next meeting will be in July for the oral presentation of their work.